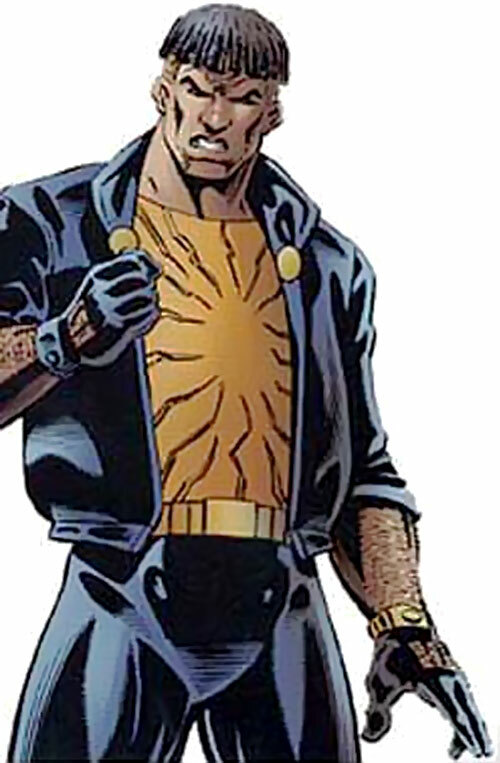 Jamal “DJ Blast” Blass was an early public ultrahuman – the name of super-powered people in the Ultraverse. 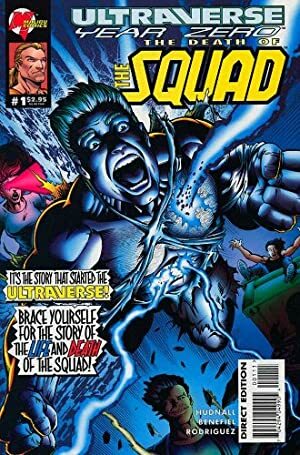 For more about the Ultraverse and the emergence of the ultrahumans in 1993, you should read our profile for his teammate, Hardcase (Tom Hawke). Base Of Operations: Los Angeles. DJ Blast can make objects explode with his mind. Furthermore, he can occasionally emit concussive blasts from his hands by detonating dust. His last effort was to make himself explode. This ultimate attack blew up the supposedly indestructible NM-E and made large chunks of concrete fly five miles or more. Jamal Blass was living in L.A.’s Watts neighbourhood . He dreamt of becoming a rap artist, and of escaping the drivebys and the strong gang pressure. But no deal ever materialised despite numerous demo tapes. One day, while cutting a demo, he involuntarily made the studio’s mike explode. Shortly after that, while he was threatened by gang members, he made their nearby car explode. Blass made the news, and even got a few contracts. Shortly after, Tom Hawke went public and upstaged him. Hawke had plans. He called Blass as well as two other “ultrahumans” who had gone public, Warren and Jimenez. He convinced them to form the Squad. The Squad went to work as ultraheroes, hitting some street gangs hard and experiencing success as well as a taste of failure. The City of Los Angeles, with most they worked most closely, organised with heavy LAPD support successful interventions against crack houses and in hostage situations. But most of the time, the Squad only did PR work. However, their true test came with the LA riots after the Rodney King verdict . Although the city would rather have them stay put, they did everything they could to stop rioting and looting. The Squad was then at the height of its success. They were so hot that the tabloids started running highly lurid stories about them (including outrageous lies by Warren’s ex). That was when NM-E, Rex Mundi’s eliminator of ultras, found them. The Squad was unaware that either Mundi or the extremely powerful NM-E existed. They were taken completely by surprise – 15 people present at Jimenez’s housewarming party were dead before they could react. NM-E performed admirably. It mauled Hawke, put Warren into a coma, impaled Jimenez then sheared him in two, and gutted Blass with chaingun fire. However, the dying DJ Blast told Hardcase to jump clear while holding the comatose Starburst. Blass dragged then detonated himself at the feet of NM-E, releasing all of his potential energy in a last gesture of heroism. The energy was enough to blow the creature — who later proved to be able to take Prime’s mightiest blows — to pieces. With the destruction of NM-E, the death of the Squad insured that the new generation of ultras could appear without being almost immediately destroyed by Mundi. The comatose Warren, and Jimenez’s corpse, were taken by agents from Aladdin, a shady governmental agency. The part of Starburst’s brain that commanded her superpowers was taken and implanted in another woman, who would become Choice. The still living parts of Forsa were also spliced into Choice’s brain. While this act gave Choice her powers, it violated the bodies of the heroes and probably ensured that Starburst would never wake up from her coma. At least, when it came to Jamal Blass, there were no remains left to desecrate. DJ Blast is the most motivated member of the Squad, even more so than Hardcase. He grew up on the mean streets, and wants justice for the people and an end to crime. Before he had his powers, his raps revolved around those themes. He uses a good amount of Watts slang, and usually refers to other Black men as “brother”. Jamal was also more willing to engage in a physical confrontation than the rest of the Squad, as he has ample reason not to trust “the system”. On the other hand, he didn’t seem to particularly distrust the police. Bomb has to be centered on a physical object of opportunity, which takes the full damage (-5 BC). Dust Particles — Ranged Damage 5. Detonating Blast — Ranged Damage 8, Area (burst), Limited (must be focused on an object). Benefit 2 (Popularity), Extreme Effort (powers only). Close Combat: Unarmed 2 (+3), Deception 1 (+2), Expertise: Lyrics 8 (+9, Limited to rap), Insight 3 (+4), Perception 4 (+5), Persuasion 1 (+2), Ranged Attack: Detonation powers 8 (+9), Vehicles 3 (+4, Limited to air and land vehicles). Justice Jamal seeks to protect the innocent and thrwart the guilty. He is particularly concerned with street violence. Limelight As one of the first public ultras, he receives a lot of attention, often unwanted. Trade-off areas. Attack/Effect PL 8, Dodge/Toughness PL 3, Parry/Toughness PL 3, Fort/Will PL 3. Points total 59. Abilities 16, Defences 8, Skills 13, Powers 18, Devices 0, Advantages 4. Equiv. PL 4.